FX Traders’ weekly EURUSD fundamental picture, market drivers, short and medium term-direction of the EURUSD trend- much applies to investors in any globally traded asset market including stock indexes, stocks, commodities, etc. Technical Outlook: As noted in Part 1, near term tight trading range with more upside potential if fundamentals provide the excuse. Longer term bearish wedge, fundamentals suggest more downside. Here’s a summary of the medium term fundamental outlook for the pair, followed by details and the shorter term fundamental drivers for this week. 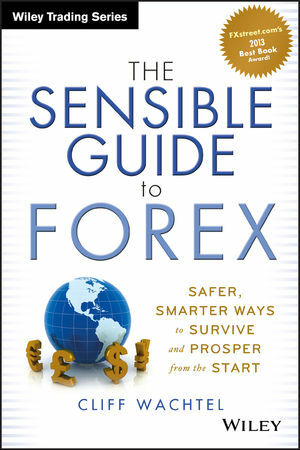 The current set of fundamentals before us continues to suggest that the EURUSD remains in its 11 week trading range of 1.36 -1.40. Why should it? ECB, Fed Policy Unlikely To Change Any Time Soon: Despite the ECB’s latest attempts to jawbone the EUR down below the 1.39 -1.40 area with threats of further easing, the EURUSD has held steady. Meanwhile the Fed has given no indication of coming policy changes, and markets have not responded to the past week’s ECB attempts to jawbone the EUR lower. Not surprisingly, the gap between benchmark interest rates for both the EUR and USD has not widened. What could break the pair out of this range? Markets see the long anticipated sustained rate advantage for the USD. Similarly, expect the EURUSD to move with any trend in USD benchmark rates. For example, the EURUSD’s drop (and USD rally) on Thursday followed rallies in 2, 5, and 10 year Treasury yields. –If risk appetite grows due to much stronger US data that also raises market expectations for a faster tightening and rise in US rates, then the pair will drop as the USD gains strength relative to the EUR. –If however, the driver of higher risk appetite does not raise expectations for a faster USD rate hike, the EUR’s higher ranking on the risk spectrum suggests that it would then gain on the USD and send the pair higher. The upside breakout for the pair could be sharp if that driver raises hopes for the EU’s recovery, for example, and widespread and sustained improvement in EU economic data. –Similarly, if a big risk-aversion driver originates from US data and thus dials back US rate hike expectations, the pair would rise on relative USD weakness. If it originates from the EU and raises expectations for more extensive easing, then we’d see the EURUSD break hard to the downside. Until at least one of the above occur, the EURUSD is likely to remain in the 1.36 -1.40 range. US data and earnings were overall better than for Europe. That was good enough to feed general risk appetite, with virtually all of our sample stock indexes closing higher on the week (assisted by last week’s close near strong support that just begged for a bounce on any excuse). US retail data was solidly better than expectations. Steadily rising consumer spending is a key to sustained US growth, and we discussed why in some depth last week here. However US data and earnings weren’t good enough to raise expectations for faster Fed tightening. Thus we see US retail sales improvements as more EUR bullish than USD supportive at this stage because the data was good enough to increase risk appetite, which would favor the EUR over the USD, but not enough to get investors anticipating faster dollar-supportive Fed tightening. A sustained uptrend in consumer spending is supported by the steady drop in first time jobless claims. 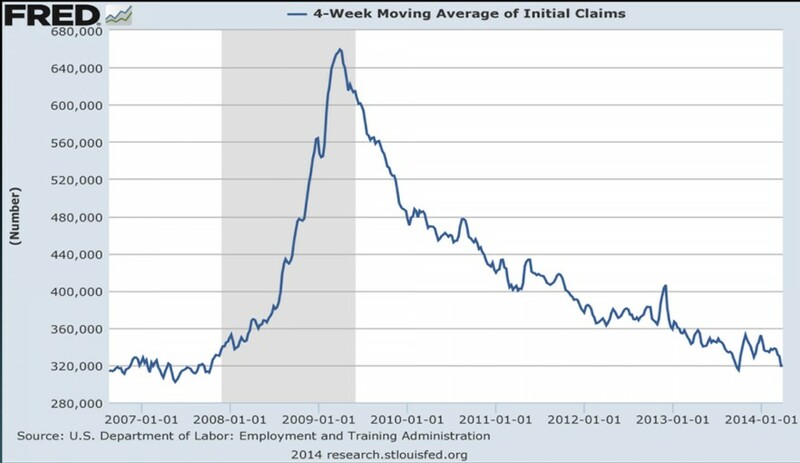 It’s also supported by a slow but steady improvement in US monthly jobs data. In sum, fewer are losing their jobs while hiring continues to slowly mop up excess labor capacity. Thursday’s rate spike aside, US rates remain subdued and relatively unchanged versus those of the EUR. This is one of the big near term EURUSD threats. Indeed the big move of the week for the pair came Monday on the heels of dovish comments from President Draghi and ECB Governing Board member Coeur. The pair stayed in a tight range for the rest of the week, partly due to low holiday shortened week activity that was exacerbated by a long holiday weekend ahead, with most markets being closed Friday through Monday. As we noted last week, many expected the ECB to try to verbally intervene if the EUR started getting close to the 1.4 level. With the recent charge back to 1.3900 Monday, both ECB President Draghi, and ECB Governing Council member Christian Noyer did just that. Draghi said “the strengthening of the exchange rate requires further monetary stimulus”. Noyer reminded markets that the ECB was set to ease if inflation stayed too low for too long, and that the more the EUR rose the more likely the ECB was to take further easing steps. The question is – will believe there is any imminent easing, or continue to believe the ECB will hold policy steady for another few months? If Monday’s big EURUSD drop was any indication, yes. But how long can ECB talk without action continue to move markets? The conflict between Russian-backed separatists and Ukraine turned escalated from threats and occupations of government facilities to a violent start of a civil was in Eastern Ukraine as Ukraine sent in forces to remove separatist rebels. Putin did not rule out sending in troops. German Finance Minister Schaeuble stated that there were ‘many signs’ that Russia was encouraging the trouble as a pretext to use either gas cutoffs or military action to extract more territory with (a Russian majority) from Ukraine. While the crisis might spark short term volatility, we suspect any related sell-offs in the EUR and other risk assets are more of a buying opportunity. See Fools “Russian”: 1 Chart Shows Why Russia Tension Selloffs A Buying Opportunity. Although relative benchmark rates for the EUR and USD are unlikely to change in the near term, the fundamental case for the ECB easing and Fed tightening remains. 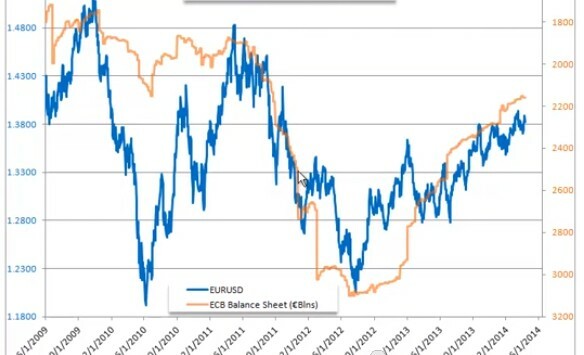 With EU banks repaying their LTRO loans, the supply of Euros, credit, and the ECB balance sheet have all shrunk, and driven the EURUSD higher as this supported EUR benchmark rates. Meanwhile the Fed’s balance sheet continues to expand, albeit at a declining pace as the taper continues to reduce the degree of Fed asset purchases until it stops towards the end of 2014, assuming no Fed policy changes on this. Higher EUR yields have encouraged purchases of higher yielding GIIPS bonds and stocks as long as complacency about the EU’s unsolved debt crisis remains. These purchases lifted GIIPS bond prices and drove their yields lower. ECB balance sheet shrinks, so do GIIPS bond yields. THE RESULT: EURUSD rises on capital inflows to EUR denominated assets. 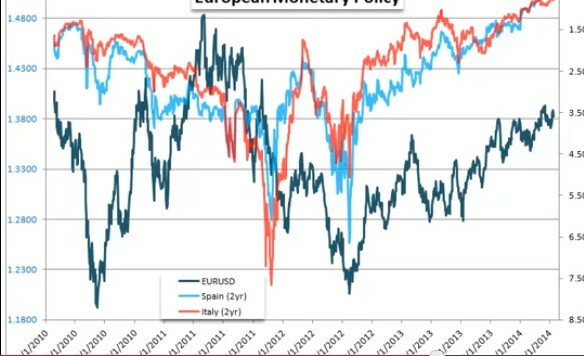 Note that Spain and Italy bond yield lines are inverted (rising line = falling yield) to better show the correlation between rising GIIPS bond demand and the EURUSD as increased EUR denominated asset demand fed EUR demand. The downside of the banks using cash to repay LTRO loans was a credit shortage, exacerbated by the coming ECB bank stress tests that caused banks to hoard cash and cut lending to all but the most credit worthy. This lack of credit and liquidity has brought weak growth and a real deflation threat. Thus an ECB and Fed policy reversal that should send the EURUSD lower is just a matter of time. 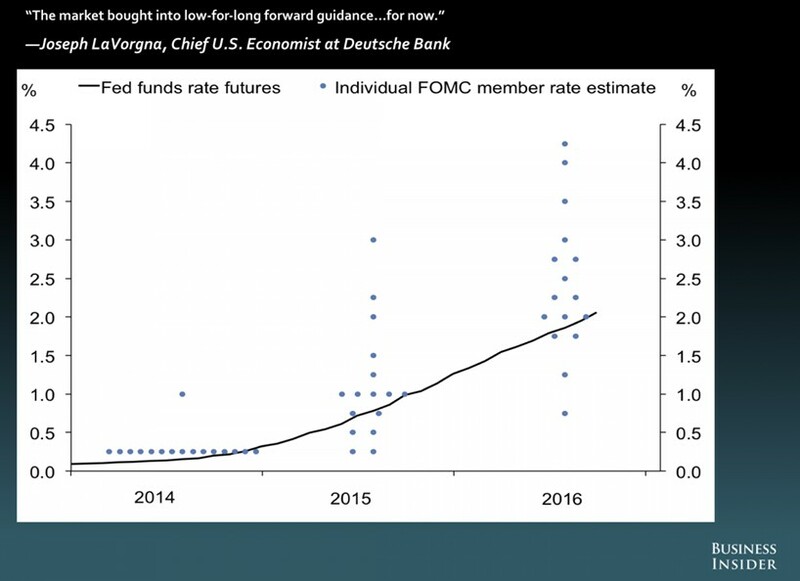 Meanwhile the better improving US economy (and growing belief that the benefits of stimulus have been mostly exhausted) have brought the Fed to begin cutting its stimulus so that it ends late this year, and to anticipate its first rate hike around April 2015. Once markets become convinced that the longer term policy shift is imminent, a test of longer term support on the monthly chart above seems likely, ~1.25-1.20. Beware that it could get much worse. Why? One of the first victims of ECB easing and a weaker EUR could well be GIIPS bond rates as investors dump EU and GIIP bonds, and stocks. A weaker EUR lowers their return and thus their demand. Goodbye to the fund inflows supporting the EUR. The GIIPS economies are little improved if at all, so rising borrowing costs could set off a chain of debt troubles that ultimately forces the ECB to print EURs to fund outright sovereign and other EU bond purchases. Any other big risk-off event could have the same effect, as GIIPS bonds and stocks are not attractive in times of strong risk aversion. Even though markets mostly shrugged off the bearish China data last Wednesday, this news reaffirms the ongoing slowdown theme and makes clear that the rate of growth from the Middle Kingdom will continue to decelerate. That said, it was anticipated, and was not seen as bad enough to outweigh the good news and the overall rally in the EURUSD and other risk assets on that day. In other words, the slowdown in its current form is priced in. The longer term risk is of a deeper than expected slowdown from the worlds’ biggest commodities consumer and second biggest economy. 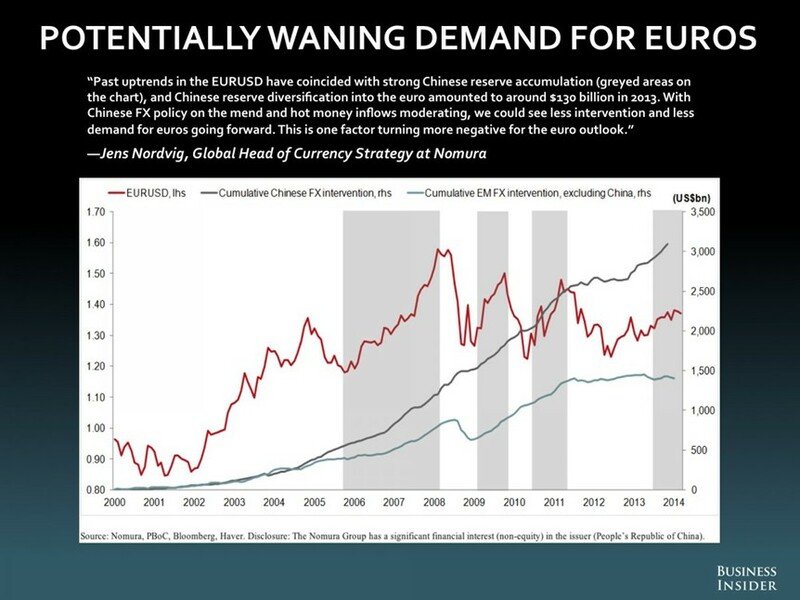 Here’s a great chart from Jens Nordvig, Nomura Bank’s Global Head of Strategy and author of my favorite book on the history, challenges, and likely future of the Euro, The Fall of the EURO. The key point is that a China slowdown means another big source of EUR demand disappears. Summary: What Will Answer The Biggest Questions On Everyone’s Mind? EUR: April’s preliminary set of EZ PMIs are expected to show further slowing in manufacturing and service sector activity growth. That may feed speculation about an earlier and/or larger ECB stimulus package. USD: Home Sales, Durable Goods Orders and Consumer Confidence figures are in the spotlight. US economic showed a notable improvement relative to expectations over the past two weeks (according to data compiled by Citigroup). If that trend continues, ebbing doubt about the continued withdrawal of Fed stimulus may offer yield-based support for the US Dollar. Continued solid data should go a long way to restoring confidence in the US recovery because it would confirm that winter weakness was indeed a temporary aberration from the harsh weather. As with the EURUSD itself, little changed from last week. It remains heavily short. Our sample continues to anticipate more downside over their average 7 week holding period. Over the past weeks the sample has shifted heavily to the short side. Generally, these directional shifts have been wrong on a weekly basis. With both the Fed and ECB not likely to make any policy changes soon, the pair is likely to move with overall risk appetite per the above calendar events. Near term fundamentals don’t suggest a move beyond the pair’s recent trading range of 1.36-1.39. However in the medium term the fundamental picture continues to argue for downside breakout.